Manchester-based pet bed manufacturers Scruffs® have announced a successful exhibition at Crufts® 2019 earlier this month. Scruffs® showcased many of their fan-favourite products, including the Snuggle Blanket and Noodle Dry Mat. Additionally, the pet-bedding company displayed beds from newer collections, such as the Rustic (pictured) and Habitat (pictured), which are designed for smaller breeds. Winter is slowly coming to an end and spring is on the horizon. As the weather starts to warm up and we see more daylight hours, the garden finally is beginning to awake from hibernation. 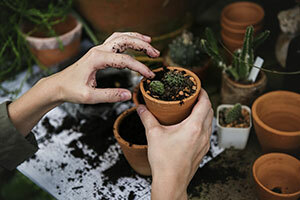 But as you begin to dust off the watering cans and gardening tools, you may be looking at what you can do to spruce your garden up this year. The Posh Shed Company’s Posh Planters are the perfect way to create a statement in your garden thanks to their simple yet stylish design. Posh Planters can be used to plant flowers, vegetables, ornamental or fruit bushes and trees this spring. 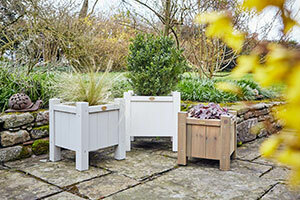 Made from FSC preserved timber, the Posh Planters are extremely hard wearing – meaning when the winter months come back there is no need to store these away. The planters are also available in a beautiful range of pastel colours – including Woodland Green, Pearl, Forget Me Not Blue, Dusky Rose, Spearmint and Posh Elephant. 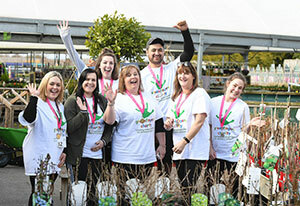 As the garden retail industry makes final preparations for the forthcoming Garden Re-Leaf Day (Friday 22nd March), the event organisers – the Greenfingers Charity – would like to take a moment to thank this year’s amazingly generous sponsors. The Garden Re-Leaf Sponsored Walk & Cycle Challenge will this year be supported by a range of leading brands, all of which come together to make the event such an enjoyable and exciting event. Kickstarting the day will be team at World’s End Garden Centres, who – as the walk and cycle start and end point – will be providing breakfast for all those taking part, as well as refreshments at the end of the challenges, helping weary souls refuel. Once again this year, SBM Life Science will be sponsoring the medals. Given out to all participants at the finish line, these medals provide a memento from a fun-filled day, and help participants to celebrate their own personal physical achievement. Whilst leading EPoS suppliers, CSY Retail, will be building brand awareness with sponsorship of the lanyards, provided to every walker. Garden Connect has launched the new webshop of Frosts Garden Centres, prior to the start of the 2019 Spring Season. The webshop is fully integrated with the OpSuite EPoS provided by DavRich. The new webshop, which can be found via www.frostsgardencentres.co.uk, reflects the new Frosts-brand. 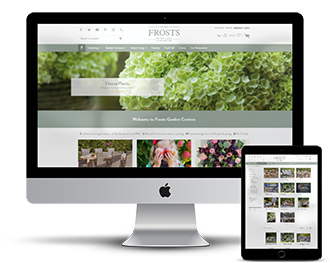 “It was important to us to renew our website to reflect our new brand” explains Claudia Roberts, Commercial Director of Frosts. “The new webshop has the same look and feel as the renewed look we are giving stores to ensure brand consistency and customer experience both online and offline”. 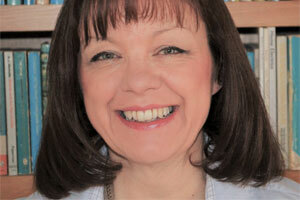 THE GARDEN Centre Association has this month (March, 2019) welcomed Jane Lawler as its new inspector. Jane, who has more than 35 years’ experience in marketing and business development, will be responsible for inspecting member garden centres in North Thames, Scotland and Northern Ireland. Ines Fanslau, Trixie Sales UK/Ireland, said: “At Trixie we pride ourselves on bringing to market the widest selection of product innovation; products that tap into the latest consumer trends and ensure pet owners are confident that they are making the best possible purchasing decisions for their much-loved pets. 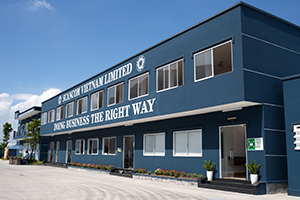 ScanCom (Vietnam), the parent company of the market-leading LifestyleGarden® outdoor furniture brand, is celebrating this week as it has been confirmed as one of the shortlisted companies at this year’s Sedex Awards. Each year, the Sedex Awards celebrate the incredible efforts its members undertake globally to ensure the work they carry out is done so in a sustainable fashion and impacts upon the environment in the least possible way. Marie Kondo has taken the world by storm. From best-selling book to Netflix Queen of Clean, the tidying expert’s unique method to decluttering has transformed people’s living spaces from a messy place that doesn’t “spark joy” into areas of serenity and calmness. As summer creeps up and BBQs and garden parties are impending, we want our outdoor areas to be a true extension of our homes and our family life, to truly make the most of the weather the next time the sun decides to shine. Yet we have all been there in May: a sudden heat wave, but a garden that has been disregarded for a few months. Our shed crammed with all sorts of items and last years inflatable paddling pool hiding behind the outhouse - sound familiar? Marie Kondo is a cultural phenomenon - her work has helped people across the globe transform their homes. 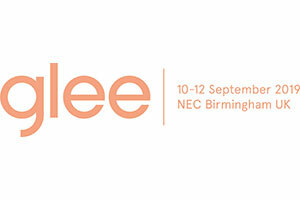 In 2019, Glee joins the digital revolution with the launch of its new exhibition smartphone app, designed to provide an unrivalled matchmaking solution to help suppliers and retailers to get the most out of their time at the show. Developed in response to the industry’s desire for such a tool, the new AI-powered event ‘matchmaking’ solution - from market-leading experts, Grip - will offer benefits for both exhibitors and retailers, utilising a platform that has already proved its worth at many leading events across the globe. The UK’s largest garden and hardware wholesaler has restated its commitment to customer support with the publication of its 2019 Big Green Book gardening catalogue. This year’s annual publication contains a wider range of products than ever before, thanks to a number of major distribution deals which Stax Trade Centres has secured in recent months. These cover lines from major names such as Honeyfield’s, Kaemingk and Harris, and they are all featured in the new catalogue. 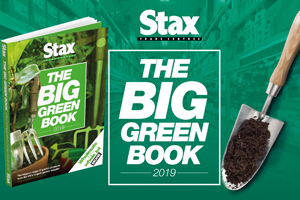 The 328 pages of the Big Green Book bring together products from over 100 of the UK’s leading garden brands, and provide Stax garden centre and retail customers with a quick and convenient reference to the huge selection of lines which the company supplies from its six UK branches. The catalogue allows them to browse through over 5,000 products from consumer brands such as Flymo, Evergreen Garden Care, Harris, Town & Country, Wilkinson Sword, Fiskars and Hozelock, as well as the popular Stax own-brand products including the Groundsman range of premium household brushes.